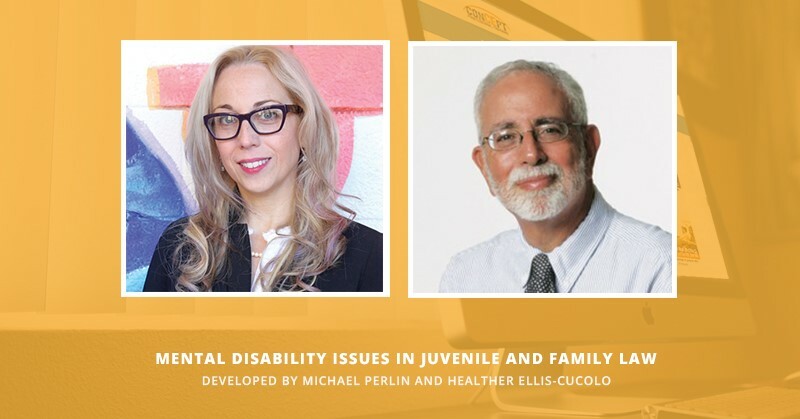 TAMPA, Fla. – Sept. 8, 2016 – CONCEPT Professional Training, a global leader in online professional training in forensic mental health, announced today that they are offering a 2016 Fall Training session called Mental Disability Issues in Juvenile and Family Law, presented by Professors Michael Perlin and Heather Ellis Cucolo. Concept’s 2016 Fall Training Session will provide the opportunity to be trained by and receive consultation from the leading experts in the field. Sessions are guided online training programs that run for 10 weeks and are 30 hours long in length. This 30-hour training program includes weekly 1.5-hr live webinars with the instructors and supplemental readings from Professor Perlin’s casebook over the course of 10 weeks, beginning on October 9th. * Issues related to juvenile commitments to psychiatric institutions, issues related to the criminal trials of juveniles with mental disabilities (including, but not limited to questions of competency and waiver), correctional facilities in which juveniles are housed, the role of problem-solving courts, and the application of international human rights principles to this area of the law. For more information on 2016 Fall Training workshops, visit the information page. Consolidated Continuing Education & Professional Training (CONCEPT) provides expert online professional training in areas relevant to criminal and civil forensic mental health assessment, corrections, law enforcement, and forensic intervention. Our goal is to provide premium professional training in an accessible online format. We believe in the value of world-class professional training, enhanced by continuing education and lifelong learning, in an online format accessible to all. CONCEPT is also approved by the American Psychological Association (CPA) to sponsor continuing education for psychologists CONCEPT maintains responsibility for its programs and their content.